For football fans, there is no better place to be than New England. And there is no better place to explore the entire span of football's history than at The Hall at Patriot Place in Foxborough, MA. "Our major objective is to add to the fan experience," says Executive Director Bryan Morry. "We want to honor the greatest Patriots of all time and preserve the team's history." Going on their ninth Super Bowl appearance, the New England Patriots and their fans are no strangers to football success. 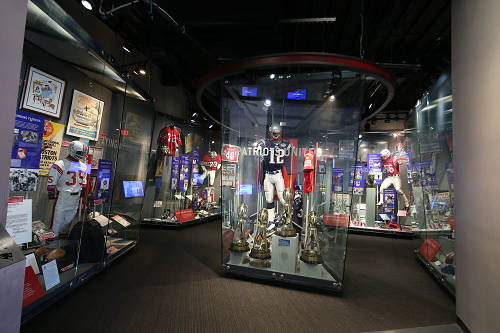 To that end, the Hall houses a trove of relics from the Patriots' storied history, including Super Bowl trophies and rings, jerseys from favorite players, and footage of legendary games and plays. 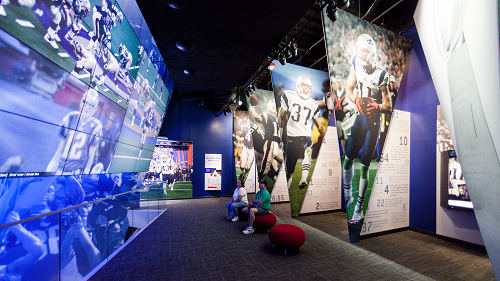 Fans may come to see such artifacts, but they stay for the cutting-edge interactive exhibits that immerse visitors in the Patriots' experience. "A lot of people come expecting a traditional museum experience, but it's so much more than that," Morry explains. "We didn't want it to be a graveyard of artifacts--we want people to be able to relive the emotions they felt during certain events." Films, audio, interactive activities, and speaker series' featuring past and present players connect fans to their team in an intimate and compelling way. The Hall also houses a changing exhibit gallery that typically features a new exhibit once a year, as well as frequent traveling exhibits, presenting an opportunity for the Hall to explore the broader scope of football history. These exhibits have covered a wide variety of subjects, ranging from Pigskin Peanuts, a traveling exhibit loaned from the Charles Schulz Museum in California, to the current Fabric of Football exhibit, which displays an extraordinary collection of jerseys spanning decades of football history. 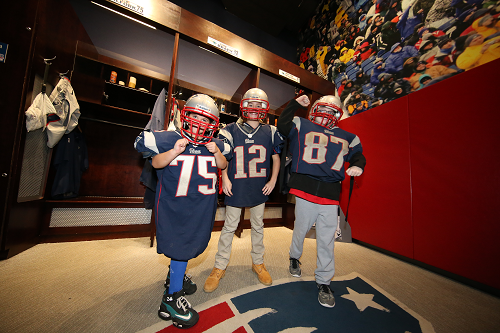 Being a Patriots’ fan is encouraged but certainly not required, as the Hall features artifacts and exhibits that football lovers of any persuasion can appreciate. "In our first year, we had visitors from all fifty states and twenty-five countries," Morry explains. "Many of them visit while they're here for games.” There is, of course, no guarantee that out-of-town visitors won’t experience a conversion. “They’re probably going to buy a Patriots’ jersey anyway,” Morry quips. Lifelong football fans and sports novices alike can find something to love about The Hall. "When people are here, they aren't thinking about whether we won or lost on Sunday," Morry says. "I love that when people come here, they don't care about what the score was. They come here for an enjoyable experience."